SPAC collaborated with local businesses in 2018 and plans to continue that trend. The Saratoga Performing Arts Center’s 2018 season was marked by new collaborations with the local business community, an expanded strategy focused on promoting cultural tourism in conjunction with the city of Saratoga Springs, and continued emphasis on presenting immersive experiences during and beyond the traditional classical season. “This past season, we furthered many of our goals to increase accessibility to the arts and to build a bridge between the community, other cultural partners, and our campus,” said Elizabeth Sobol, SPAC’s President and CEO, at the October meeting of the board of directors. Sobol cited the SPAC partnership with the Saratoga County Chamber of Commerce and the downtown business community to present the first-ever Freihofer’s Jazz Fest Friday, which celebrated Saratoga as a world-class jazz city and promoted the region’s vibrant downtown. In other collaborations, SPAC and the Saratoga Automobile Museum partnered with the city, the Chamber and the Saratoga Convention & Tourism Bureau to present the “Bugatti Parade,” as part of the Saratoga Wine and Food Festival. “We wanted to ensure that the community at-large—and not just ticket holders—had the once-in-a-lifetime opportunity to witness the majesty of 80 Bugattis as they processed from the Spa State Park to Broadway. The parade brought thousands of viewers to downtown Saratoga Springs and created a palpable energy throughout the city,” said Sobol. Additional partnerships with the city and NYRA also promoted Saratoga Springs as a cultural destination through a national public relations campaign crafted to spur economic development. “The past several months have been focused on building new partnerships with the local business communities, while also continuing to nurture our cultural collaborations,” said Sobol. She said SPAC is projected to finish the 2018 fiscal year by operationally breaking even. Audience attendance at 2018 classical season performances exceeded projected levels. Sobol noted that SPAC’s goal to bring new audiences and encourage multiple visits was realized with a 31 percent increase in first-time ticket buyers. “Expanding upon our focus in 2017 to enhance the accessibility and affordability of the SPAC experience, this year we targeted new audiences and incentivized multiple ticket purchases,” she said. 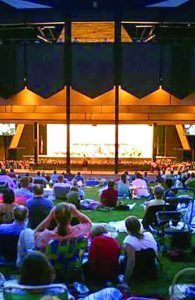 SPAC launched a new partnership with public radio stations WMHT in upstate New York and WRTI in Philadelphia to record and broadcast four Philadelphia Orchestra concerts in Saratoga. The new series marked the first time in the orchestra’s storied 52-year residency that Saratoga performances have aired on WRTI in Philadelphia, reaching a listenership of 25,000 per concert through the WRTI broadcast and the HD radio broadcast. In 2018, SPAC’s free education programs reached more than 38,000 young individuals, offered more than 165 classes, presentations, performances, and events, and partnered with more than 90 schools and non-profit organizations across the greater Capital Region. The 2018 education programs reached 15,000 more students than in 2017, by visiting an additional 20 schools, and holding 40 more classes and events. SPAC held its first Festival of Young Artists this past June. Free to the community, it celebrated the achievements of 450 young dancers, musicians, singers, poets and visual poets from all over the Capital Region, bringing approximately 3,000 guests to SPAC’s grounds, including many first-time visitors. Sobol said the state’s $1.75 million initiative to rehabilitate and upgrade SPAC’s amphitheater ramps, lighting and other infrastructure is slated to be completed in advance of the 2019 season. As part of the renovation, the ramps will be resurfaced and will include new panels and railings, which will meet current ADA standards. Additionally, the lighting will be more energy efficient, while preserving the character of SPAC’s signature globe light fixtures. SPAC announced the dates for the 2019 classical season, which will include seven performances by resident company New York City Ballet from July 15-20, and the Philadelphia Orchestra for 12 performances from July 31 to Aug. 17, in addition to an array of other music and dance offerings in the amphitheater. The Chamber Music Society of Lincoln Center will return to the Spa Little Theatre from Aug. 4-20. SPAC on Stage, Live at the Jazz Bar and Caffè Lena @ SPAC will also be back by popular demand. The board welcomed new members Bill McEllen, leader of Fingerpaint’s Saratoga Springs office; philanthropist and state Council on the Arts member Jaynne Keyes; C.J. DeCrescente Jr., president and CEO of DeCrescente Distributing Co.; and David Jersen, CEO of Jersen Construction Group.